Have you ever dreamed of travelling the world in style, but it seems out of your reach? Search no more, Welcome to DreamTrips. DreamTrips is an elite travel club for adventurers and luxury travelers and everyone in between. It’s the ultimate travel club community–travel anytime, anywhere. You’ll experience customized travel opportunities and valuable deals at fine restaurants, energized clubs and exquisite hotels. You will receive Five (5) star trips at Two (2) star prices. Once you become a member you will save a ton of money on travel to anywhere in the world. 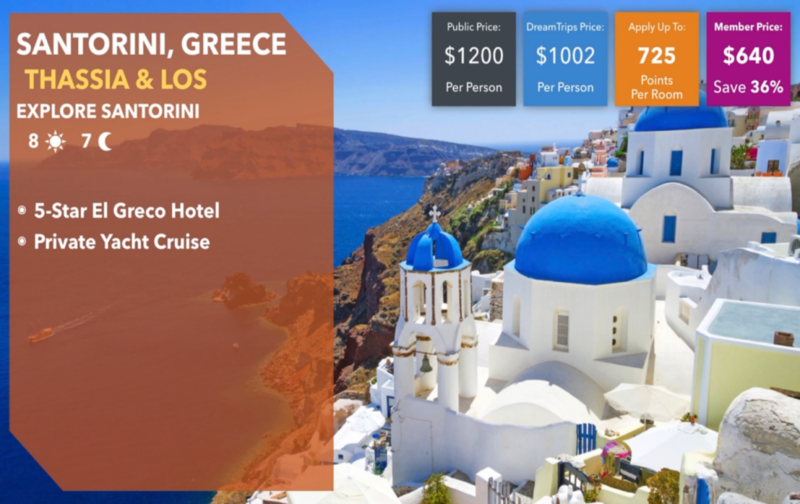 You Earn DreamTrips Points when you pay your initial and monthly membership fees ($1=1 point). These points can be used to reduce the rate of your trip, even lower than it already is. Earning points is as simple as Dining Out at your favorite restaurants all over the world. It gets even better! You can earn money from referring friends and family. When they sign up you get a commission of $20.00, and best of all your monthly fee is waived for good, just by signing up four (4) persons, and you will still receive your points! Additionally, you receive points from referrals! This is the best way to travel and earn. If you are not interested in the business, you can just sign up just for travel. You are treated as VIP when you travel all over the world. As a member you also earn when you shop online at over 4000 stores, these funds are called Rovia bucks that can be used for your trips. You also receive major discounts in over 4000 stores online. Normally, when you book a hotel it is per person per night, not with DreamTrips. Say you are booking Royalton Negril, Jamaica, it is usually US$300 per person per night; with DreamTrips it is US$300 per person for your entire stay, whether two (2) nights or seven (7) nights. You also get access to many special member-only rates. Dreamtrips members who book their flights through DreamTrips receives a product called RateShrinker; what this does, is that when you book your flight and the rate decreases the RateShrinker rebooks your flight for the lower rate and refunds the difference to your credit card. This happens each time the rate is reduced. All members get US$200,000.00 flight accident insurance. There are different membership levels; as a Gold & Platinum member you receive extra perks such as telemedicine, emergency Jet evacuation, Discounted Online Shopping, Roadside Assistance, Personal booking website, Concierge, DreamTrips Vehicle Purchase Program and many more exclusive deals. It was originally US$280.00 to sign up, it’s now for US$150.00. Sale ends very soon. Here is a special video that will inspire you & provide more info. NB: Persons cannot join the club without sponsor ID# 300213316. It’s an invitation only club. So if they go straight to Dreamtrips.com, they would have to put in the sponsor ID to sign up. You can contact me at fivestartrips@yahoo.com . This entry was posted in Travel Ideas and tagged Trips. Bookmark the permalink.